'Carried Dancing or Pageant Giants' is an exact description. The principle interest of the guild is in carried giants. There are giants made to run on wheels. Whilst wheeled giants have many merits and are a worthy subject for study in their own right, they don't don't move well, they can't dance and generally they're not in the same class. So there! On the left is Christopher III. His worthy predecessor, the first Christopher still stands in the Salisbury and South Wiltshire Museum, he's at least 420 years old. Christopher III was built by Jeremy Turtle ( in the picture too ) and friends. 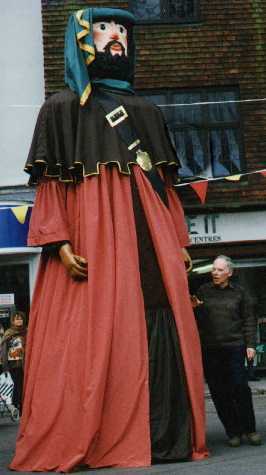 The new giant is to be seen every St. George's day at the 'Riding the George' pageant in Salisbury. This is Bertilac du Haut Désert, the green giant from the Gawain story. He's not a BIGG member. He is operated by the Graund Order of Guisers from London. G.O.G. were among the first groups to build modern British giants. 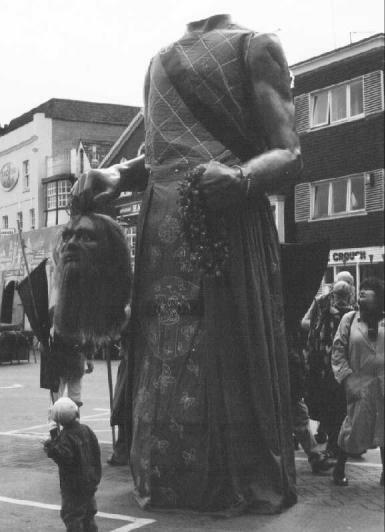 their first giant 'Gogmagog' was for a time one of the biggest giants in Europe. This is Caroline Moore, one of the Dorchester Giants. Here she is seen watching a parade in Maastricht. 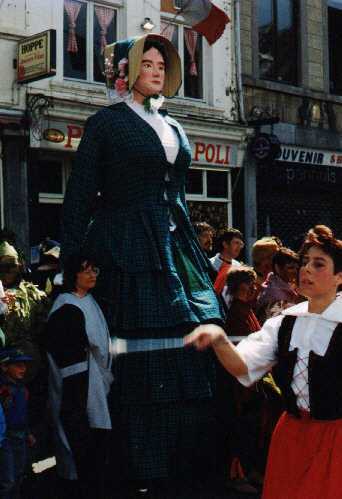 Many European festivals are provided with giants as a matter of course. British giants are starting to appear at some of the bigger festivals. The British Isles Giant Guild would like to make it easier for Giants from other parts of Europe to attend events in these Islands.